We have just entered a new racketlon year and also a new phase in the history of racketlon with a new IRF President and a new elected Council presently finding their ways of working. To Racketlon.com this means good timing for a survey of the game of racketlon. So, all country representatives (see who they are here) to the IRF have been invited to reflect a little on the past, present and future of racketlon in their respective countries. In addition, the new IRF President, Austria's Marcel Weigl, will write about his vision for the future while his predecessor Sweden's Hans Mullamaa, will look back on developments during his presidency. Contributions will be published in this news section under the title "State of Racketlon", as they drop in during the next few weeks. First out is the UK, the country that has clearly and increasingly posed the biggest threat to Scandinavian racketlon dominance during the last few years. As shown by names like Sarah McFadyen and Calum Reid. Is British Racketlon about to take off in a way we have never seen before in any other country? Look for the answer in the text below. Good luck rackateering in 2006! Watch out, we are growing fast, we have the quality venues, coaches and plenty of racket players. The potential is awesome, England is becoming more coordinated in its approach and eventually legalised in due course. A strategic change of tournament management in 2005 saw the UK international tour events - The Scottish and English Opens become the most successful ever to date. Stuart Foster and Phil Reid handed over to Keith Lesser and Neil Russell respectively. Foster and Reid go down in history as the original pioneers for UK Racketlon and are still actively involved as members of the International Racketlon Federation Council. The 2006 World Tour has been announced and The UK Events will be in September and October. We are in the mists of setting up the first "British & Irish Racketlon Tour" to be announced on an ad hoc basis. A 3rd large tournament for sure has been added to the UK calander and the British Closed Championships (see tournament website!) to be held on 1st/2nd April in the West Midlands should be a cracker and warm up for the England team players for the forthcoming World Team Championships in Belgium in June. This will provide a taster of the 2006 English Open tournament venue and we are hopeful of a good turnout. Redbridge Sports Centre (probably the best racketlon venue in England) have announced that they will run a racketlon taster day in the Spring. Eastbourne David Lloyd and Abbeydale Sports Club in Sheffield have been offered dates in July and August. These are at a fairly advanced stage of development. Negotiations have also started with Manchester and Dublin David Lloyd Centres, so we can see if these events come to something. There are a number of other possibilities, which a number of individuals are investigating. Hopefully, all will be finalised in the spring. Certainly, we will look to hold another competition in our most seasoned racketlon venue at David Lloyd Heston. The launch of a series monthly Club nights is a very exciting development as a pilot for other David Lloyd or branded clubs. The Heston Racketlon Club is coming! Furthermore, we hope to breathe new life into the racketlon.co.uk website and with regular news and calander updates, UK Racketlon is set to grow and grow! For sure, we have already started the irresistable task of planning the proposed 2007 World Championships. This news has brought further joy to sports fans across the island, already ecstatic at the news of the 2012 Olympics. We are warming up. 2007 World Championships Breaking News Development - Already short listed Manchester Sport City zooms to the top of the list for what is likely to be the biggest ever racketlon event held on the globe. The venue for both The National Badminton Championships and The National Squash Centre (holding a series of huge squash competitions) - 7 courts, as well as an indoor tennis centre (6 indoor and 6 outdoor courts). Also, in close proximity to the Manchester City Centre, Sport City also hosts The City of Manchester Stadium (48,500 capacity) and The National Cycling Centre, this complex has huge potential for a racketlon event. Indeed, this is the very place where Stefan Adamsson spectated the British Squash Open last October and where the Commonwealth Games were held in 2002. Come on England, lets win the world team championships in 2006! 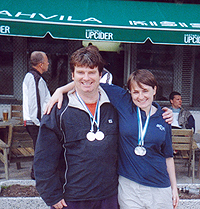 Left: English representative Stuart Foster showing off medals together with Scotland's Katy Buchanan after the 2004 Finnish Open. Right: English Open Tournament Director Keith Lesser performing in Belgium. P.S. One more thing: Click the link below if you want to join the UK Racketlon discussion group! This will let you take part in our discussions either by e-mail or thtough a web page interface. Next article in this "State of Racketlon" series coming up within the next few days: Austria - including the visions of the future of new IRF President Marcel Weigl. Stay tuned to Racketlon.com!